7mL kit includes 50 preps of a mix of ceramic (zirconium oxide) mix beads of 2.8mm and 5.0mm in 7mL standard tubes with O-ring. 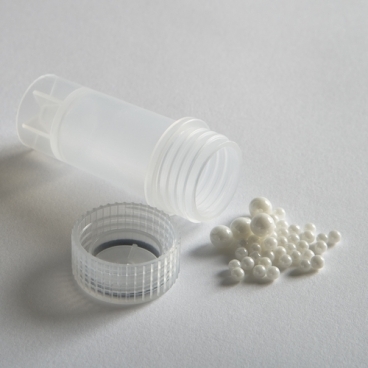 15mL kit includes 25 preps of a mix of ceramic (zirconium oxide) mix beads of 2.8mm and 5.0mm in 15mL standard tubes. CKMix50 is designed for grinding whole organs. CKMix50 is designed for grinding whole organs like rat brain, liver, kidney, skin, whole iris-ciliary body pork and dry samples as pepper grains and more. Sample size range for 7mL: from 200mg to 2g tissue or 200microL to 6mL culture. Sample size range for 15mL: from 2g to 4g tissue or 1mL to 9mL culture. Compatible with Precellys Evolution, Precellys 24-Dual, Cryolys and Minilys.